I am very happy with this purchase. I never thought I'd spend so much money on an umbrella, but when researching I found that the cheap ones fall over, aren't maneuverable and look cheap. I spent two weeks looking for the right item and found it. Love the solar strip too! This highly adjustable shade offers powerful protection against the dangerous effects of the sun. Its high quality mechanism can block sun both directly overhead and at an angle, allowing you and your guests to enjoy your time together in the fresh air without exposing yourself to harmful rays. This shade also has the added benefit of coming with a solar light strip so the fun can keep going all night long. This umbrella was a fantastic purchase. 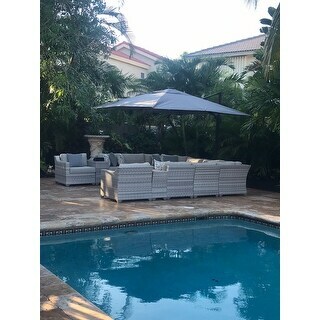 It provides shade for all 4 of our Christopher Knight aluminum chairs lounge chair. My husband remarked the grouping has a high-end hotel vibe. I liked the sheer size of the shade this umbrella provided. It took a while to put together, and there was a very small hole in the shade which wasn't noticeable until it was complete and put up. It wasn't worth complaining about as it has made no long term difference to its use. The solar lights at night provide a nice glow. We were unable to use our porch in the summer cause the heat was too much. I looked at umbrellas and some were several thousand dollars! 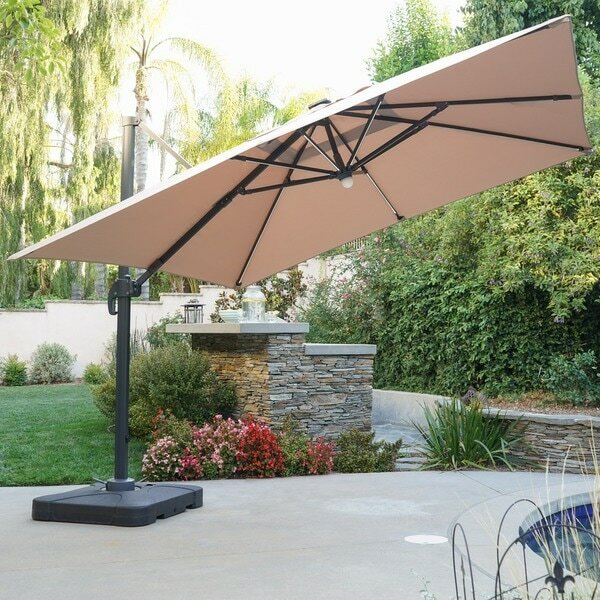 This umbrella looks great, is adjustable and allows us to sit outside without getting baked by the sun. I might just buy a 2nd one to use on the other end of the porch! Great umbrella, nice shade. Definitely fill the base with sand/water before opening! Thi is a beautiful Umbrella, the picture shown is an accurate representation. It is a little annoying to close because it is so large it hits our table when closing it but it’s not a huge deal. I wish the light was a little brighter but the quality is great and assemblt was easy. This is a great umbrella for the price. The color is a warm grey. It feels very sturdy and after being out most of the summer in full, afternoon sun has experienced no fading. "Is the canopy high enough to walk under it? Can it be used over a dining table?" The overall height is 101 inches. "Does the base of this umbrella have wheels?" The base does not have wheels. "How does this hold up in the wind?" It holds up well as long as the recommended amount of sand is filled in the base. "The picture shows a square umbrella, the specs say it is round. Which is it?" It is a square umbrella. "What umberella cover can we get to protect it when we’re not using it which one will fit this umbrella?" "Can i buy just the base? How much does it cost?" "Can you tell me the dimensions of the base?"